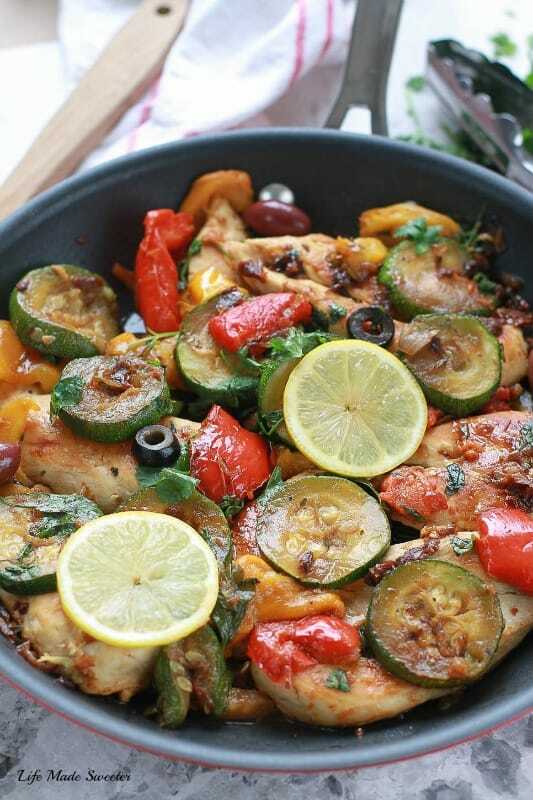 A healthy, fresh, and flavorful one skillet meal full of Mediterranean flavors – chicken, zucchini, bell peppers, sun-dried tomatoes, lemon and full of fresh herbs. This is a simple dish all made in one-pan over the stove-top. I am still on my one-pan-dinner kick lately. We’ve had glorious summer weather lately and like most of you, we’ve been spending most of our days outdoors and the last thing any of us want to do is spend a ton of time fussing over dinner. This Mediterranean Chicken Skillet is another meal that is ridiculously easy to put together but tastes like it took all day to make. It’s kicked up with a ton of fresh flavors from the cilantro, parsley, basil and bright lemon that has the ability to add happiness to any dish. It was also perfect for cleaning out the fridge so I could use up those extra veggies I had lingering around..I tossed in some sun-dried tomatoes, zucchini, red and orange bell peppers and kalamata olives. We start by browning the chicken on both sides until it’s nice and caramelized. Remove the chicken from the pan, then saute the onions and garlic. Pile a layer of zucchini until it has some color then toss in the sun-dried tomatoes and bell peppers. Add the chicken back in, pour in the chicken broth and seasonings, cover and allow to simmer until the chicken is cooked through. Toss in some sliced lemons and herbs and dinner is served. 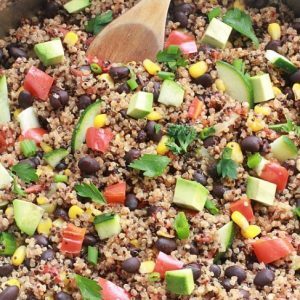 Healthy, delicious and easy peasy. Serve it with your favorite sides or enjoy it alone grain free. 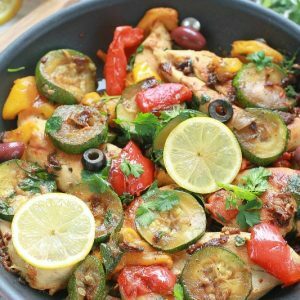 A healthy, fresh, and flavorful one skillet meal full of Mediterranean flavors - chicken, zucchini, bell peppers, sun-dried tomatoes, lemon and full of fresh herbs. This is a simple dish all made in one-pan over the stove-top. Season chicken with 1/2 teaspoon of salt and pepper or to taste. Heat 1/2 - 1 tablespoon of olive oil in a large skillet over medium heat, then add the chicken and brown for 6 minutes on each side or until medium brown. Remove chicken and set aside on a plate. Add another 1/2 - 1 tablespoon of olive oil to the pan. Add the onion and garlic and saute for about 1-2 minutes until softened. Layer on pieces of sliced zucchini cooking until slightly golden brown, a few minutes on each side - working in batches. Push aside the zucchini to one side and add the sun-dried tomatoes, then bell peppers and stir-gently. Transfer the chicken back to the pan and add chicken stock. Turn heat to medium low and cover until chicken is cooked through and the sauce is slightly reduced - about 7-9 minutes. Add in dried oregano and fresh herbs (cilantro, basil, and parsley) and allow to simmer for an additional 2 minutes uncovered. Season with additional salt and pepper to taste as needed. Remove from heat and garnish with additional herbs if desired and serve with favorite sides. What also helped make this meal so enjoyable was being able to cook it in this 12 inch skillet I received from the Circulon® Prime collection. Not only did everything cook very evenly it made the clean up afterwards a breeze! It worked like a charm to brown the meat and vegetables without having anything stick. It’s metal utensil safe so I was able to use my metal tongs to flip the meat without having to worry. It’s a beautiful sturdy skillet that includes Circulon’s® patented TOTAL® Nonstick System — a series of raised nonstick circles on the pan surface that reduce the amount of nonstick in contact with cooking utensils, minimizing surface abrasion and maximizing durability. Check out Circulon®‘s site for more products and information. And you can win your very own Circulon® 10″ skillet for all your cooking. Circulon® is sponsoring a giveaway and all you have to do to enter, is use the rafflecopter widget below. The fine print: Giveaway open to U.S. and Canadian residents 18 and older. One entry per person (multiple entries/comments will be disqualified). Winner will be selected via a random number generator and contacted via the email address used to leave the winning comment. Winner will have 48 hours to respond, at which point another winner will be chosen. The giveaway will remain open until 11:59 pm on June 21, 2015. Disclosure: This is a sponsored post created in partnership with Circulon®. However, recipe and all opinions are my own. You make the best one pan meals, Kelly! And your pictures are absolutely gorgeous! I could make one pan meals just about every day, especially ones that involve mediterranean flavors. My husband would love this too, which is even better! 🙂 Looks so delish! Thanks Gayle, you’re the sweetest! Isn’t it nice when our husbands like the same meals we do? My husband really liked this dish too which is saying a lot since he doesn’t usually like veggies haha. Happy Friday! I love a one=pan dish any time of year but particularly now when it’s so busy with end of year school activities and whatnot. You will be even more busy (than you already are!) come September and as the kids get older, in a different way. : ) It’s a good thing you can whip up something so delicious so quickly. Love an easy healthy chicken entree. Thanks for sharing! Yay, one-pan meals rule! Thanks Kristi! Happy Friday! This is just a skillet full of BEAUTY! Chicken beauty. 😉 Seriously though, I love all the color you loaded into one pan and it seriously looks so easy to just throw together any old time! It was so easy and my meat loving husband even liked the veggies 🙂 Thanks Sarah! Happy Friday! One pot meals are the best! Not only is it easier to make and clean up, they taste amazing. 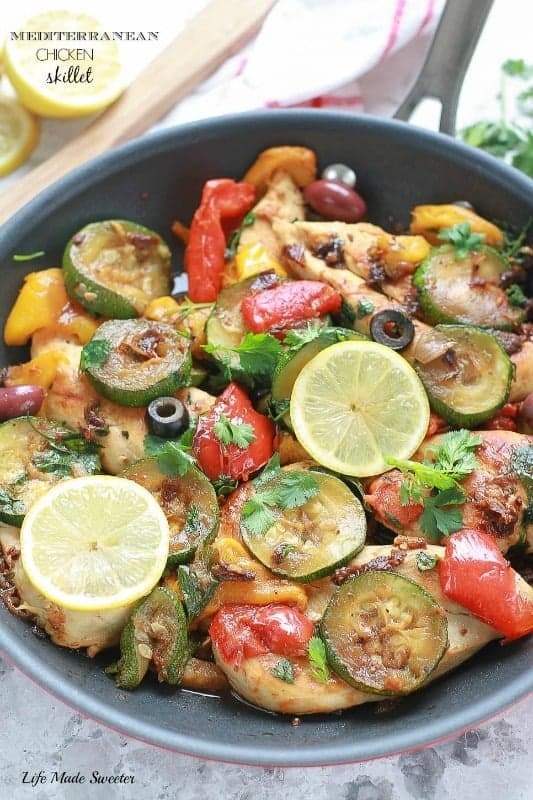 Love the ingredients in this Mediterranean chicken! One pot meals definitely make things a bit easier 🙂 Thanks Kathy! Now this is 100% my kind of dish, I love that it’s one pan! All of the vegetables sound so fresh and delicious, and I love the addition of sun dried tomatoes, they’re so tasty! This looks like the perfect dinner, I definitely need to try it! Thanks Harriet! Our family loved this dish. Hope you enjoy if you try it! Happy Friday! What a mouthwatering recipe, Kelly! I am seriously drooling over this skillet! Beautiful and YUMMY! What a perfect summer supper! I can’t wait for zucchini season to be in full swing so I can make this! Thanks Julia! Summer zucchini is my favorite! I love that this is one pan, the colors in this dish are so awesome, too! Love all the veggies! What an awesomely flavorful and colorful dish. The perfect dinner! 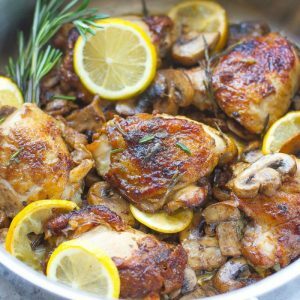 Lately I am all over one pan/pot meals Kelly and this chicken looks superb for this warm weather! Yay for one pan/pot meals! Thanks Ami! 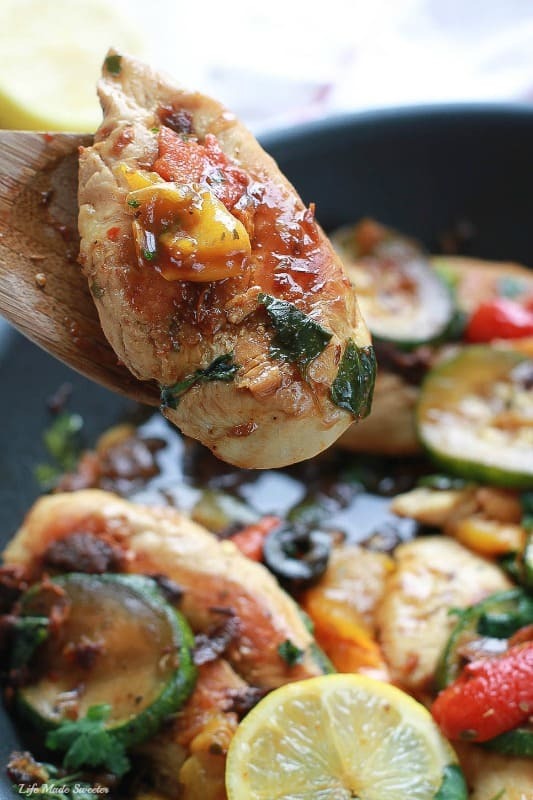 Love, love, love al the ingredients, the veggies on top of the chicken looks so delicious and juicy, this is one pan meal that I would gladly try. Oh my – I’m madly in love with this dish and those veggies look so fun and colorful. Yum! Hope you enjoy your Summer before the little one goes back to school. Kelly, I know how you feel! My youngest will start 4k in the fall .. she went to pre-school 3 days a week and now will be going 5 days a week!! AHHHH! and love your one-pan-dinner kick!!!! love all the flavors in this chicken skillet! delicious and what a great giveaway!!! How is that I knew this recipe was yours when I saw it floating around on social media without even looking at the blogger?! You are seriously the one-pan cooking queen and I love it! Pinned! Haha, you are the best, that’s why 🙂 Thanks girl and for pinning! Happy Friday! I love one pan dish meal…this looks absolutely delicious…all you need in a meal…thanks for the inspiration Kelly! I LOVE one pot meals especially with all those gorgeous veggies! These pictures are gorgeous Kelly!! YAY for one pan meals! Love how this is loaded with tons and tons of flavors! This chicken skillet looks so fresh and delicious Kelly! Love the flavors! Great giveaway, too!!! Haha thanks girl 🙂 Happy Friday! 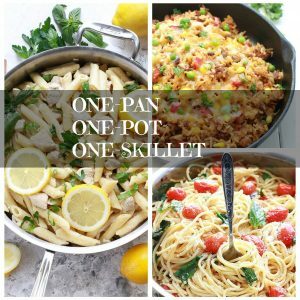 I absolutely love your one pot meals! This one looks so dang delicious! I love one -pot/pan meals! And I love when onions and garlic are involved in those meals – thanks so much for sharing this easy, use-all-the-veggies, chicken dinner! Wow, this is incredible, Kelly! Thank you for sharing. 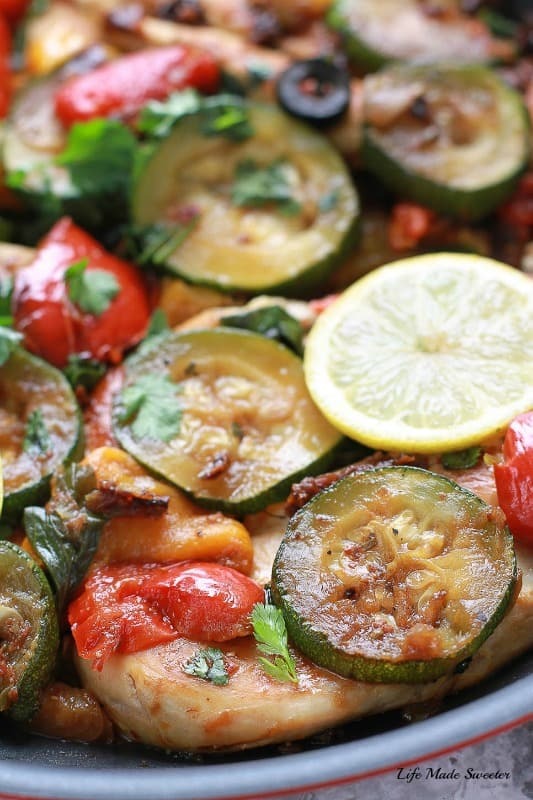 I love summer squash with chicken. What a healthy, flavorful meal. Thanks Erin! Same here, I adore summer squash! Happy Friday! 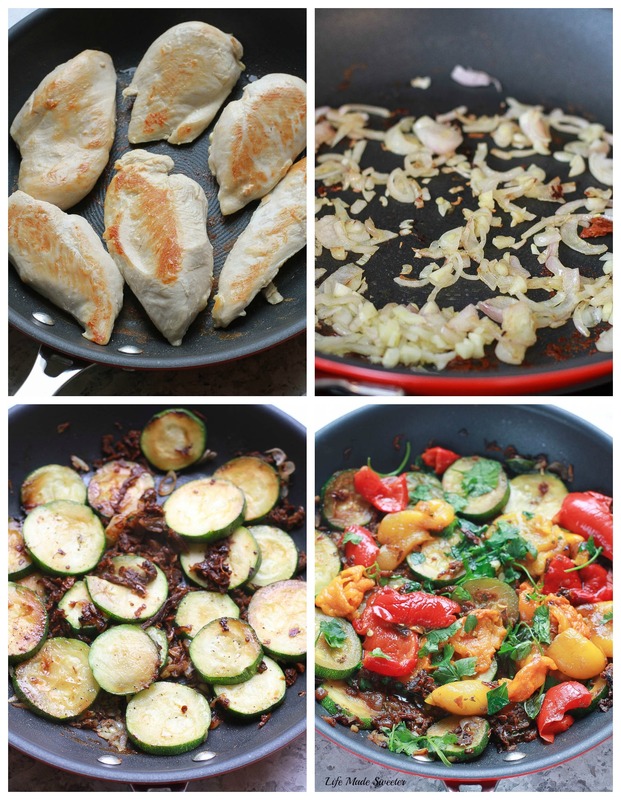 Easy one pan veggie-stuffed dishes like this are what summer eating is all about! Mediterranean flavors are the best! This one pot/pan meal looks so summery and delicious. I’m such a big fan of chicken. It’s so filling and you can make it in so many different ways. Great recipe! One pot dinners are where it’s at in the summer. Who wants to be inside cooking when you can be outside with the the kids?! This chicken looks fantastic! I have been allll about mediterranean flavors lately! This dish looks awesome Kelly. And you cannot go wrong with one-pot! I can’t believe your little guy is starting school already! I feel like you just had your daughter the other day – time is flying. This chicken looks so flavorful and delicious! I love all the Mediterranean flavors! One dish meals are so awesome and time saving. This recipe looks delicious! yum! I can’t wait to try this out! 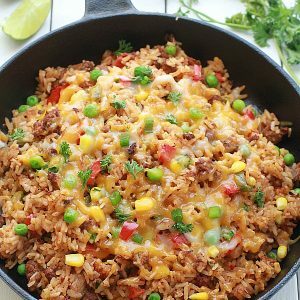 I love one pan recipes, so easy with cleanup in the kitchen and easy to serve as well. I was actually looking for a dish I could serve over the weekend using chicken and cilantro that is a bit different from hubby’s traditional Guatemalan foods we make thanks for providing the recipe! I will be trying this recipe. It looks yummy, and I love 1 pan meals, especially when they include boneless chicken breasts. Thank you! Dinner at your house is looking de-licious!